Halloween has crept up on me this year and my instagram feed is making me feel all left out. I love a bit of Halloween, but I don’t really want to spend a fortune on decorations which I then have to find somewhere to store all year. After a little bit of Pinterest inspiration I realised it’s not that hard to make a few extra spooky decorations. 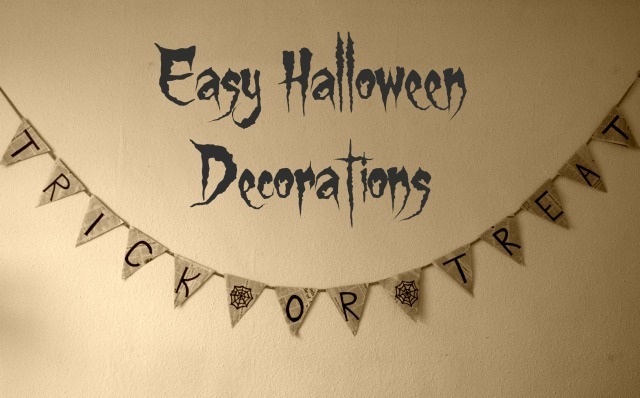 These are all really easy halloween decorations to whip up and most of the things I needed were already around the house (so they’re cheap too, woohoo!). The first was to update some Happy Birthday bunting, which has managed to stay up since my birthday (in August…). Now it’s the end of October, I cut triangles out of newspaper and using my trusty old black sharpie, turned Happy Birthday into Trick or Treat. Easy and really cheap too. I attached the newspaper with blu tac so that they’ll peel off without damaging the bunting underneath, which is all ready for the next birthday. 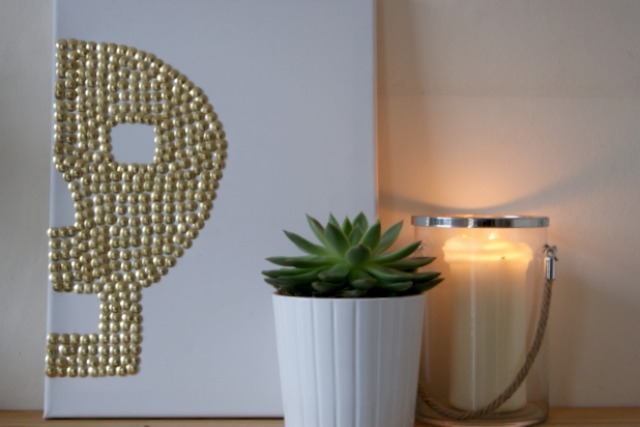 I love this skull canvas, which is made just by adding brass tacks. All I did was sketch out the picture I wanted to create, add the tacks around the edge, then fill in the middle. 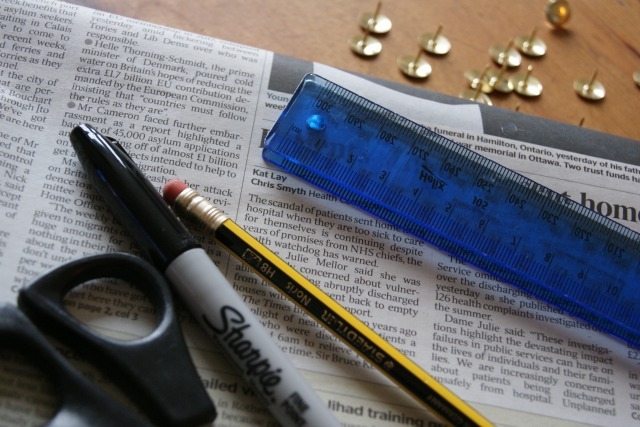 This used around 300 tacks, which came to a grand total of £1.50, plus the cost of the canvas (£1.25). So cheap that I’m happy to make it just for Halloween, but I actually think I love it enough to keep it for much longer. This is a particularly easy Halloween decoration, made entirely of recycled things around the house. 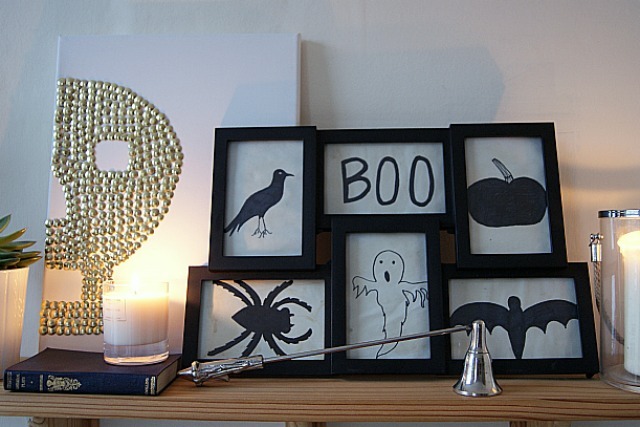 This photo frame normally contains photos (as you would expect), but is temporarily home to some spooky sketches. In the spirit of recycling, I cut up old envelopes and cut the backs to fit the photo frames. 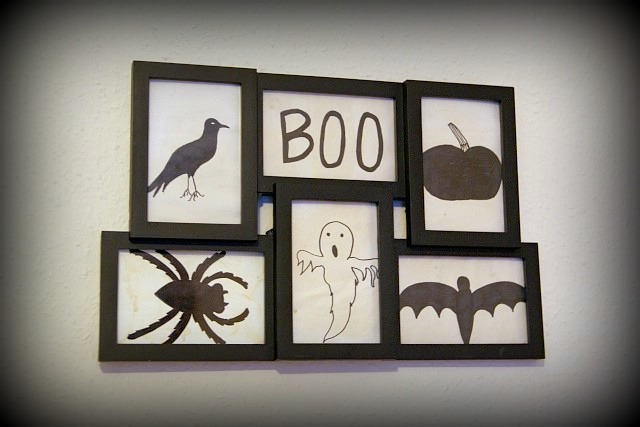 I aged the paper by painting it with coffee and, once it had dried, I drew some Halloween images and boom, easy Halloween decoration. A few days after Halloween, my normal photos can go back in and the pictures can be recycled so no finding extra storage for this.